This is a print first feature in STIR magazine. Robin Hood Coop (RHC) is a community-led data-driven Hedge Fund-like organisation run by academics, hackers, investment consultants and artists - to name a few. It was founded in 2012 in the aftermath of the 2007/08 financial crisis and set out on the mission to find new ways of expanding and protecting commons. So far, it has made roughly €150,000 for members and projects. The coop is the first iteration in an ongoing attempt to answer the common refrain of; "What is to be done?" We use financial technologies to democratize finance, expand financial inclusion, and generate new economic space and have been called by Michel Bauwens of P2P Foundation one possible way of financially ‘irrigating the commons’. 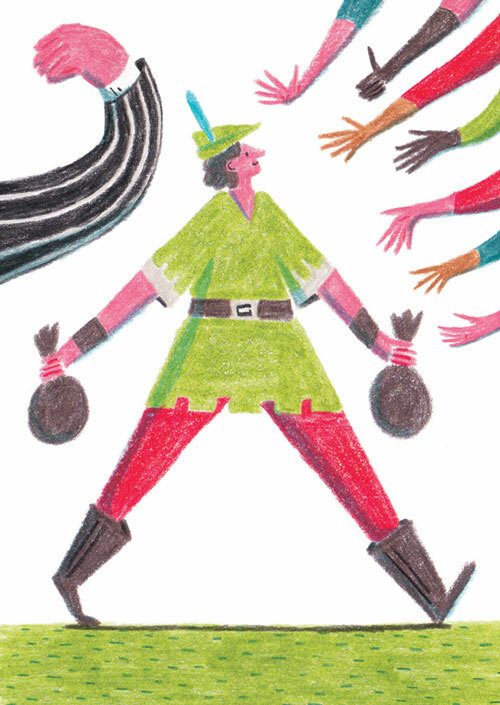 Robin Hood’s proposition is no different than it was 600 years ago in Sherwood: arbitrage the routes of wealth and distribute the loot as shared resources. Today we just use different methods to achieve the same: we analyse big data, write algorithms, deploy web-based technologies, and engineer financial instruments to create and distribute surplus profits for all. Why? Simply, we believe a more equitable world is a better one. Anyone can join the coop by paying a one time membership-fee of €30 and one mandatory share for an additional €30 (there is no upper limit to the number of shares you can purchase and payments are also accepted in Bitcoin). The mandatory share gives you full rights in matters of the co-op (one member, one vote), allows you to propose yourself to be part of the selection committee for distributing Robin Hood Projects (RHP) funds and also allows you to propose projects to be funded. Projects can be of any class but must broadly fit the meta category of expanding commons. We currently have 650 members, so there will be 650 definitions of what is understood as commons. Each year, three members from those who have proposed themselves are randomly selected to choose which of the proposed projects to give the funds to. RHC is not a Hedge fund in the typical sense, then. It is a first generation attempt at democratising finance, or as Professor Luca Guzzetti put it; "another way to Occupy Wall Street". "What to do? ", we hear you ask. Come and get involved - we suspect we'll value your involvement much more than your local bank. If you have a pension, use a credit or debit card, were born in a country or have a student loan—your money is already entangled within the financial markets. "So what? ", you might ask? . An increasing awareness is growing that we cannot ignore what happens on the financial markets. As readers of STIR are well aware, the social and organisational technology of working together as a cooperative, made new space emerge in and around the workplace of the 19th & 20th centuries. It could be said this was part effect of a changing distribution of power. By space I mean here that new possibilities for organising, living together and control over important aspects of our lives became possible in different ways by cooperating. In 2015 it is less clear how to create these types of spaces, the types of spaces that allow us the means to autonomously determine our conditions. What social and organisational structures can we forge to open these spaces? If we expand our understanding of 'the means of production' to include the financial markets - how to cooperate there also? Underneath the Hedge Fund-like institution is an experiment in tinkering with this expansion of understanding the means-of-production to include the financial markets. If you have a pension, use a credit or debit card, were born in a country or have a student loan—your money is already entangled within the financial markets. The recent referendum in Greece could be seen as one example of what happens when you try to make a choice other than that allowed by the existing power structures. Not having the space to realise the assertion of ‘no-more-austerity’. This is one aspect of what a Financialized economy means; there are no financial virgins and we do what we are told by those from on high. Whether intuitively or by experience we know that our financial services model is dangerously out of date. Projects such as Move Your Money UK, Robin Hood Tax, Positive Money, the Edge Fund show that people are yearning for radically better approaches to finance. RHC's proposition could then be boiled down to this: Where you keep the money you do have, is a political choice. What is less clear is what to do and how to organise in the face of decreasing employment availability with austerity and automation. What to do in the face of the pressing issues of our time, such as Climate Change. A million people have taken the time to sign petitions asking Governments to tax banks. Untold numbers of people have put the time, care and energy into moving banking providers. At Robin Hood Coop we wanted to try something more direct. “Money is not something bad, it is good. We just need to reengineer its flows and the financial technologies that govern it, so that they will serve us and not only the banks”, Virtanen says. This was also the goal of the 20th century co-operative movement which provided people ways to share into the benefits of their work in a democratic way. Robin Hood is a cooperative 2.0 that has been updated into the age of financialised economy and to the needs of the on-demand and sharing economy workers. The next step is to transform the cooperative into a digital form so that people all over the world can join with their smart phones and buy its digital shares. This is made possible by the so called blockchain technology whose first application was the Bitcoin. Blockchain is a kind of shared public accounting system for internet, which makes possible secure transactions and contracts directly between people without any intermediaries. Now it must be said that there are no guarantees of Robin Hood’s success. The first year there was more profit (31%), and the second year less (10%). The possible losses are of course also shared by the cooperative. If you would like to join us in this transmutation of a cooperative for the 21st century, within a financialised economy—a good place to start is our forums. Published in STIR magazine no.11, Autumn 2015.